When a patient is diagnosed with epilepsy, it is important for the physician to properly classify the seizure disorder. Many of the antiepileptic drugs (AEDs) only work for one or certain classes of seizures. Classification of seizures has changed throughout the years. Dr. Loftus, a neurologist who treats adult seizure patients, find it is easiest to divide epilepsy into two major types, partial-onset and generalized onset. The complex partial seizure is the most common type of seizure disorder that begins during the adult years. This type of seizure causes the patient to lose consciousness. A seizure that begins in a focal part of the brain and does not cause loss of consciousness is known as a simple partial seizure. An example of a simple partial seizure is a shaking limb that cannot be controlled (Shaking limbs can be from things other than seizures as well). Another type of partial seizure is one that begins in part of the brain and then spreads to both sides of the brain. This is known as a partial complex seizure with secondary generalization. The classic absence seizures of childhood, formerly called petit mal seizures. This is one that begins over the entire brain at one time. The typical event consists of staring spells that coincide with a characteristic three cycle per second spike and wave pattern on EEG. 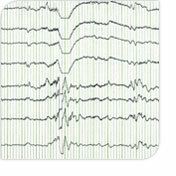 Generalized tonic-clonic seizures are another generalized seizure type. These begin with violent shaking all over the body. Still another generalized seizure type is the atonic seizure, drop-attack. These are manifested by a sudden loss of consciousness with a fall to the floor. After training and then in private practice since 1994, Dr. Loftus has evaluated and treated hundreds of patients with epilepsy yet has personally only witnessed about a dozen live seizures. Therefore one of the major problems with epilepsy treatment is proper classification, especially when the patient is unable to give a detailed history. For example, a patient may have a partial onset seizure that generalized and caused tonic-clonic movements all over their body. The patient may have had this seizure in public and the only history he will have is what the paramedics told him when he was on the way to the hospital. Keep in mind; the paramedics got their information from people on the scene that said he had a grand mal seizure. The patient himself may remember nothing except being in a store one minute and waking up confused, tired, and aching in an ambulance or emergency room. At the other extreme, a generalized absence seizure and a partial complex seizure may both present as staring spells that the epileptologist (an epilepsy expert) can only tell apart from the EEG. Treatment selection must take a team approach. With more than a dozen good medications to choose from, it is essential that the physician listens to his patient to identify what side effects need to be avoided and which are desired. We have seizure medications that cause weight gain, some that cause weight loss, and others have no effect on weight at all. Many seizure patients have migraine and the two treatments can be combined. Dr. Loftus believes strongly that epilepsy treatment is a "team sport." Read what his patients say about him here.